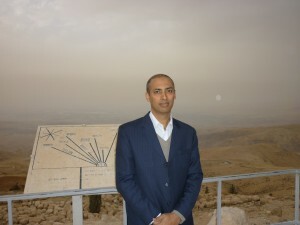 As I reached the Royal Jordanian airline check-in counter to board the flight to Amman, capital of Jordan (Urdan). Lady took my passport, tapped in my name into the system and then disappeared into their office asking me to wait. I waited and waited, seeing all passengers finishing checking in. After 15 worrying mins she came back & enlightened me that I have already been checked in. what, I enquired! Don’t worry she replied, it is only a mistake done by my colleague who checked in someone else as Mr K Ali. So nice of her; as a result I was allocated a seat in the LAST row, right on the tail of the plane; meaning an uncomfortable and noisy flight. Luckily I managed to change my seat on board to a comfortable one. Jordan is a small country bordering izra eel, Palestine, Iraq & Saudia, with 6 million people, 60% Palestinian origins, 30% locals and 10% others, all Sunni Muslims. No wonder everyone here hates izra eel deeply. Others do also but Jordanians have first hand experience of their aggression. As said by one Izra eeli prime minister, our (izra eel’s) first defence is muzlim leaderz in surrounding countries. This is true. 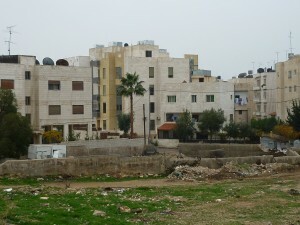 Jordan’s culture is similar to Arabs but Jordanians seem livelier. Country is greener & climate is moderate than Middle East. Nearly all houses are white / cream coloured and built with square windows & straight walls & (like a cube). I tried a local dish Mensaf (lamb cooked in yoghurt & eaten with rice), it was really tasty. They eat many types of dressings & salads with the food, especially humous, lemon and vinegar pickled vegetables. Actually food here is quite nice. It is very meat oriented and has influence from Greeks, Romans & Arabs, who were present here at different stages in history. I went to visit Jabl-e-Nebo (Nebo Mountain) which was, as Christian history describes, visited by Musa (Moses) AS before his death. Allah promised Moses AS the land of Izra eel. However it was not granted to him but only shown near his time of passing away. Moses AS was buried somewhere here after his death; no one knows the exact location. Jesus AS baptising place is also few miles away. 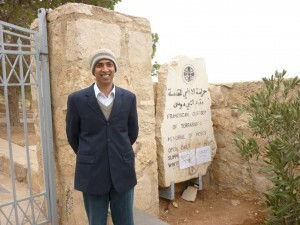 Many holy places of Palestine & surroundings sacred for Jews, & Christians & Muslims are within 50 miles from here. As narrated, there were two villages of nation of Hazrat Lut AS called Sodom & Amoorah (Gamoorah by Christians). Allah Ta’ala was displeased with their bad deeds. He commanded the angle to put their villages on his wings, go high & then flip them down. 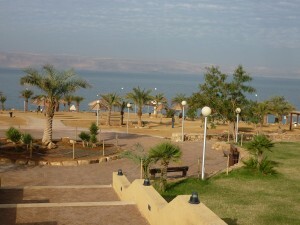 As a result Dead Sea was created, which is the lowest place on earth, a place to learn lesson. Prophet used to pass away quickly from such places of punishment. 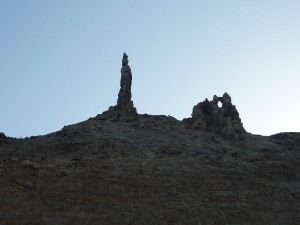 This pillar of rock near the Dead Sea (image above) is believed by Christians to be the wife of Lut AS, who looked back at the punishment being inflicted on the people and as a result was turned into a pillar of salt. According to the Holy Quran, the wife of Lut AS was inflicted with punishment but her turning into a pillar of salt is not specifically mentioned. Allah SWT knows best. 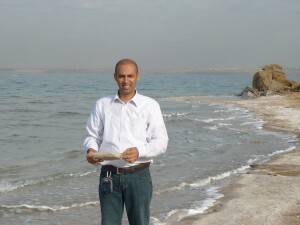 – It is a salt lake in the west of Jordan and in the east of Israel & West Bank area. – Its surface & shores are 422 meters below sea level, the lowest elevation on the Earth’s surface on dry land. – The Dead Sea is 378 meters deep, the deepest hypersaline lake in the world. – It is one of the world’s saltiest bodies of water, with 33.7% salinity (salt). – Its water is deadly. There are no fish or any kind of swimming, squirming creatures living in or near the water. – Fish accidentally swimming into its waters from river Jordan that provide water to the dead Sea, are killed instantly, their bodies quickly coated with a preserving layer of salt crystals and then tossed onto shore by the wind & waves. – You won’t drown if you swim in it, rather you will float. 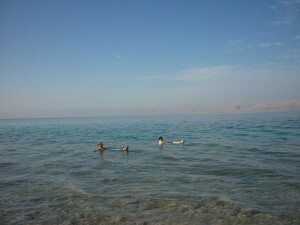 I also had a float in the Dead Sea. I liked so much that I got late and hence missed my flight.